Will day six ever come to an end? So lets see, we explored the Royal Mile, St. Giles’s Cathedral, the Heart of Midlothian and Edinburgh castle with the Honours of Scotland. All that is left for this day are two final destinations. 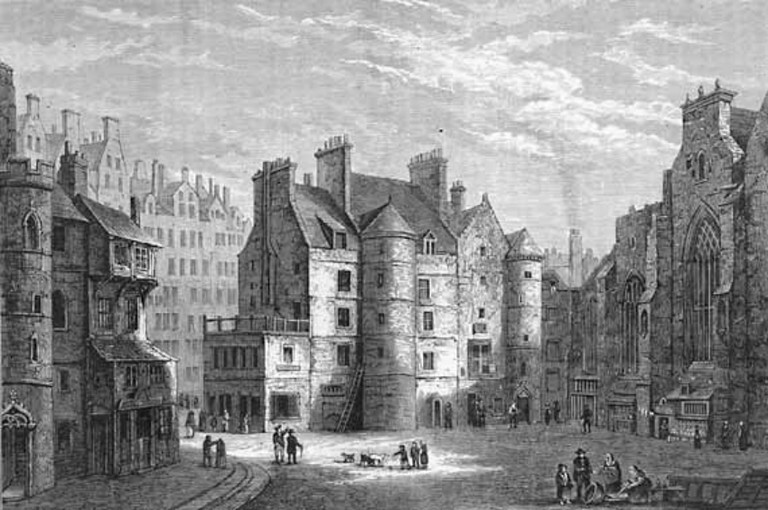 The first was a historic landmark called “The Real Mary King’s Close”. A historic Close located underneath the Old Town in modern-day Edinburgh. Close is a generic Scottish term referring to alleyway but it may also be a name used for entry, court or wynd (narrow streets between houses). A Close is private property and thereby fenced, walled or gated from public access. Many slope down from the Royal Mile giving the impression that it looks like a herring-bone pattern with the side streets coming off the main street. Many of these have steps of long flights or stairs. Edinburgh was a walled city and security was a premium with the city coming under English attacks; therefore high density of housing was understandable. The Close or narrow streets were flanked with tall buildings on both sides giving the alleyway a canyon-like feel and look. Many of these Closes were residences for the general public but others were trade or profession specific. All along the Royal Mile you can see signs above entryways to these alleys, the names of the Close. Fleshmarket Close I learned refers to the butchers, or livestock profession. Others you can guess from their names; Old Playhouse Close, Old Fishmarket Close, Advocate’s Close, Cooper’s Close, and Bakehouse Close just to name a few. Mary King’s Close is on the Royal Mile and is open to the public for tours as a historical Close. It is named after a Mary King who was a merchant burgess who lived in the Close in the 17th century. In the 18th century it was partially demolished and closed to the public to erect the Royal Exchange. Not until 2003 was it reopened to the public as a historical site and visitor centre. There we were able to enter the world of the 17th century to see and experience how it felt like to live in those times. It is a rather long walk down many flights of stairs and at times it felt the air was closing in on us, however I enjoyed the tour and I would highly recommend it to anyone going to the Royal Mile for the first time. An eight-yard kilt (this is the length of the kilt. 5 yard kilts are party kilts where 8 or 9 yards are more formal dress kilts). A ghillie shirt (a traditional Scottish shirt you wear with the kilt). Socks and flashes (worn at he top of the socks near the knees that are the same tartan pattern as the kilt). A chain and leather Sporran (a traditional highland pouch worn in the front of the kilt). A leather belt and buckle. The two things I was not sure of was the tartan pattern I wanted in the size I needed and the colour of the shirt and socks. The shirt and socks were easy, I got black, but the kilt was a little more challenging. I decided to get the Modern Black Watch Tartan (Royal regiment of Scotland, to honour all soldiers past and present) instead of the Scotland or any family tartan. But I was not sure if they had my size. After trying on two that were too large, I found the size that fit me. Yes!! 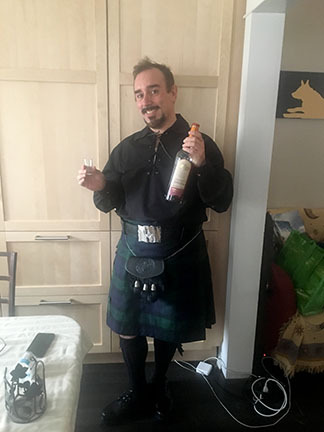 I had finally got my kilt and not something I can wear as a costume but as formal wear. I wanted one for some time and it only seemed fitting to get a kilt in Scotland. This way I can wear it at formal occasions and if I like to work (which I did a month after I returned home). Wearing My kilt. A bit of Scottish Culture. The kilt is not simply formal wear or an extra piece of clothing. It is a reminder of a culture I learned about and on this trip, experienced for the first time. This day was filled with learning and experiencing many aspects of what Scotland is and has to offer. It seemed fitting that I ended the day wearing a little bit of that culture. A piece of Scottish culture that will remind me of Scotland every time I put it on. So far day six has been a rather busy day. Exploring the Royal Mile, St. Giles’s Cathedral, the Heart of Midlothian and yet with all this, the day’s adventure was only half done. We stopped for lunch and this is where we decided to split off. Two of my friends had to go meet a friend for dinner while my other friend and I went to explore a few more sights. Our first stop would be Edinburgh Castle. We arrived close to closing time but we had enough time to explore only one of the castle’s amazing sights. Within the castle we had several areas to explore but we decided to view the Scottish Crown Jewels. Within the royal palace I was able to see the many artefacts and images of the kings and queens of Scotland but the grand finale were the crown jewels of Scotland. The Scottish Crown Jewels, Scottish Regalia or Honours of Scotland date back to the 15th and 16th centuries and are the oldest surviving set of crown jewels in the British Isles and have never left Scottish soil. They were used in the coronation of Mary, Queen of Scots in 1543 up until Charles II in 1651. Since then they have been used to represent Royal Assent in both the Estates of Parliament and the Scottish Parliament. They were also used in state occasions such as the first visit of Queen Elizabeth II in 1953. In 1540, the crown was remodeled by James V, by Edinburgh gold smith John Mosman. It weights 3 lbs 10 ozs, or 1.644 Kg. It was made from Scottish gold from the Crawford Moor mine and encrusted with 22 gemstones and 20 precious stones from the original crown and freshwater pearls from Scotland. A gift from Pope Alexander VI to James IV in 1494 and then remodeled in 1536. Made of silver gilt and topped with polished rock (possibly Cairngorm) and a Scottish pearl. 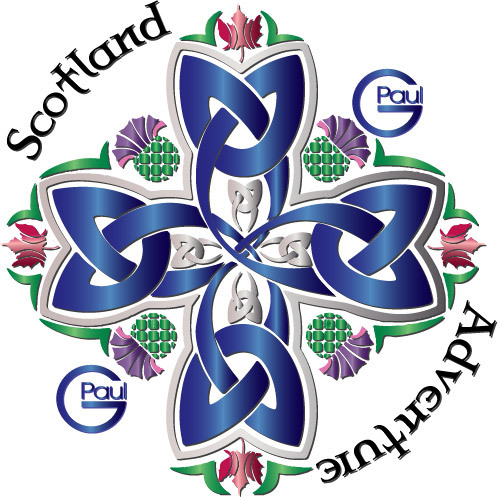 It also has religious symbols on it including the Virgin Mar hold Christ, St. James the Great and St. Andrew holding a saltire or the Cross of St. Andrew. A gift from Pope Julius II to James IV in 1507. It is an etched blade about 4.5 mtetres long that includes the figures of St. Peter and St. Paul. The sword was damaged, broken in half to be hidden in 1652 when it was being hidden from Cromwell’s troops. One other item that is not part of the Honours of Scotland but housed with them is the Stone of Scone. Also known as the Stone of Destiny or the Coronation stone it is housed with the Honours of Scotland. It is a rather unimpressive large block of red sandstone that was used in the coronation for many Scottish and later English monarchs for centuries. However, this artefact was kept in the now-ruined Scone Abbey in Scone, near Perth Scotland. It was also known as Jacob’s Pillow Stone and Tanist Stone. It is about 66 cm (26 inches) by 42.5 cm (16.75 inches) by 27 cm (10.5 inches) and weights about 152 Kg (336 pounds). It has a rough incised cross on one surface and iron rings on either end, probably for easier transport. 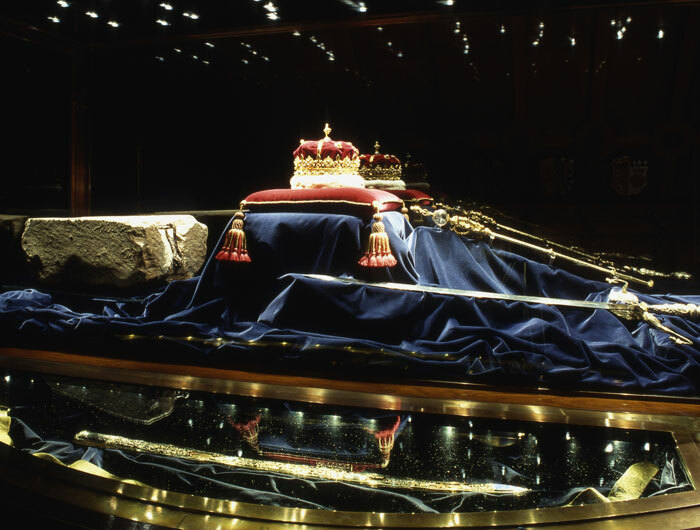 It was last used in the coronation of Elizabeth II. In resent history a group of Scottish Nationalists stole the stone back to Scotland in 1950 but it was quickly returned. This has brought into question the authenticity of the stone. 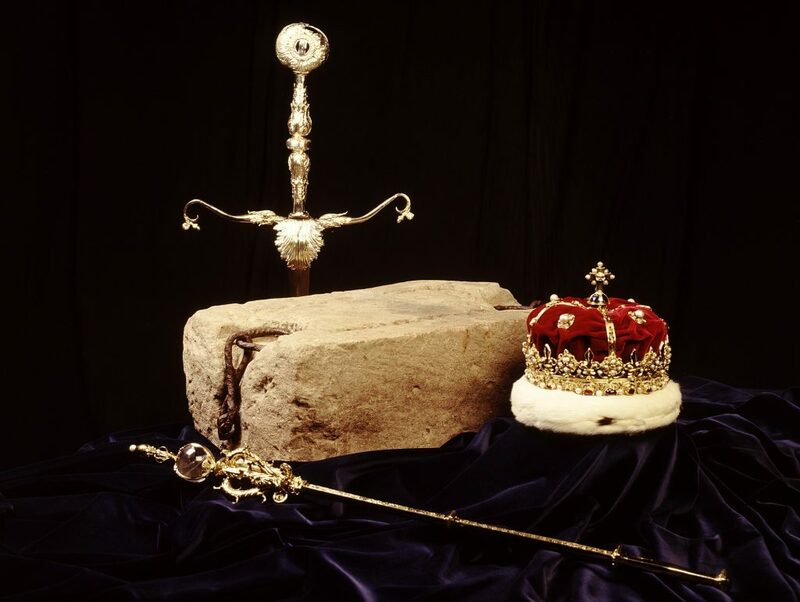 Yet in 1996, as a symbolic response to Scottish dissatisfaction with the British Government, they decided the stone should be kept in Scotland when it is not being used in coronations. On November 15 1996 a handover ceremony was held at the border and the transported to Edinburgh Castle. On November 30th 1996, St. Andrew’s Day, it arrived at the castle for the official handover ceremony. Prince Andrew, Duke of York, representing Queen Elizabeth II, formally handed over the Royal Warrant transferring the stone in the safe keeping of the Commissioners of Regalia. We only had a few hours to read through the history of the Honours of Scotland and also viewed them. I was told that if you like history Scotland has a lot to offer, well I was not disappointed. From kings and castles and now the Honours of Scotland I could spend the days just reading the writing on the rich history Scotland has to offer. But this day I was privileged to view a few pieces of history that has affected the destiny of millions of people. Outside the St. Giles’s Cathedral is a very famous landmark in Edinburgh known as the Heart of Midlothian. It is near the west door of St. Giles’s High Kirk on the High Street section near the Duke of Buccleuch statue. It is also near the Parliament House, which use to hold the Scottish Parliament but it is now the home of the Court of Session. 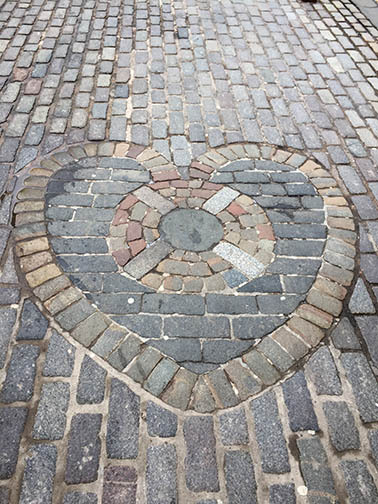 The Heart of Midlothian is a heart-shaped mosaic made from granite setts and built into the adjacent cobble stone walk way. It is named after the historic county of Midlothian, which Edinburgh is a part of. If you are in Edinburgh you may find the locals doing something rather disgusting to this famous artistic landmark; they would spit on it. Not something you would think people would do to something that looks pleasing to the eye but there are a few traditions and stories around spitting on the heart. Some say it is good luck to spit on the heart; others that it is a gesture of good luck for the Edinburgh football team the Hearts F.C. For visitors, the only way to guarantee your return to Scotland/Edinburgh someday is if you spit on the heart. Yet as nice and interesting as those stories may be, the true legend of the Heart of Midlothian is a right more interesting. The heart is actually located at where the Old Tolbooth building once stood. Built in the 14th century the building housed the administration centre of the town and the prison. In fact the heart is the location of the front entrance to this infamous prison. It had a reputation all across the United Kingdom (UK) because of its vile, damp and dark conditions. No one was safe within these walls for it housed every manner of person from petty thieves to murders and even the innocent. Stories of torture were not unheard of here too. Bad as all that sounds it did not stop there. The Old Tolbooth was also the location for many public executions by hanging. Many were tortured and then left for dead, while others were publicly mocked by wearing iron collars. If that was not bad enough body parts and severed heads were impaled as a warning to others to not engage in criminal activity. The conditions at the prison got so bad that Mary, Queen of Scots stepped in , in 1571 and had a New Tolbooth built. The Heart was built at the doorstep of the New Tolbooth yet torture and executions continued until it too was finally torn down in 1817. Whatever the reason I too spat on the heart, as a precaution so that I guarantee my return to Edinburgh. Yet after doing the research into the Heart of Midlothian I appreciate my act a bit more. Yes I too have a disdain for what happened at the Old and New Tolbooth, but I am more of a rogue/pirate at heart and I love the idea of showing my contempt for the authorities, therefore I too will take that Scottish phrase ‘The Law is only a suggestion.’; to “heart” as well. After running around the Scottish highlands and lowlands for five days we ended up in Edinburgh at the Adria house. A quaint Georgian town home now run as a bed and breakfast (B&B), this is a wonderful location to begin our exploration of Scotland’s capital. After another great breakfast (like I said I loved the food in Scotland), we set off to explore Edinburgh on foot. We made a quick list of some things we would like to get while we were out to bring back to Canada. Most of it was of course souvenirs, yet I would be looking for something more traditional of a local flavour. I had my heart set on purchasing a kilt to bring back with me. Not a simple kilt such as something you would wear for a costume, more along the lines of something I could wear to a party, formal gathering/wedding or simply on a special occasion. My friends knew about this and I got some well-needed advice and hints on purchasing one. However while I was looking for one I would be taking in a lot of the local atmosphere of this old yet beautiful city. Our first stop or journey would be to walk and discover the wondrous things a street called the Royal Mile had to offer. The Royal mile, as the name suggests, is about a mile long starting from Edinburgh Castle at the top of the hill, to the Holyrood Palace at the base, near the Scottish parliament buildings. This main street in the old town where many businesses cross is the busiest tourist street in the old town. 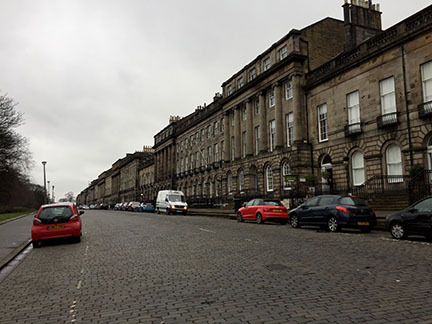 Along this street you can see many tourist shops and attractions as well as many cultural centres such as The Real Mary Kings Close, St. Giles’ Cathedral and or course Edinburgh Castle; all of which we visited. But first, we explored the streets looking and taking in the atmosphere that is Edinburgh. We walked up and down the side streets and we came upon the café where J.K. Rowling sat in to written her famous Harry Potter books. We even walked by George Heriot’s school, the school that she modeled Hogwarts after. From this location we were able to get a spectacular view of Edinburgh Castle. As we were walking to the castle the view reminded me of another castle I had read about long ago from another famous author, JRR Tolkien in the Lord of the Rings, Edoras. Edoras is the city capital of Rohan. Looking up at the castle I imagined that I was on a quest to Edoras to see King Théoden. You can call me a nerd but views such as this, stirs my mind to places created and destroyed within my imagination. Yet imagine, hundreds if not thousands of people have walked these streets seeing the same views, the same places. However many simply walk past oblivious of the moment in time they are experiencing. This moment will never come again, we should savour it to its fullest and this image will be one I will treasure for a long time. We will be exploring castle but first we explored another building seemingly stopped in a moment in time, St. Giles’ Cathedral. Also known as the High Kirk of Edinburgh, St. Giles’s Cathedral is the main place of worship for the Church of Scotland. Dedicated to St. Giles, the patron saint of Edinburgh; he was a very popular saint in the Middle Ages, probably because he was also the patron saint of cripples and lepers. Today’s church dates back to the late 14th century even though it went through extensive restoration in the 19th century. Today it is seen as the “mother Church of Presbyterianism”. We made our way into the cathedral and it is a lovely example of architecture of the day. I’ve seen older churches but this church had some wonderful stain glass windows I have only seen in pictures. I found their artistry enchanting and I spent a great deal of time taking in the little details in them. I particularly enjoyed the stain glass windows near the altar that depicted the main life moments of Jesus. The most memorable were the miracle at Cana, the expulsion of the money changers, the crucifixion, the resurrection and the assentation. I know all these stories from reading them in the bible and of course hearing about them at church. Yet no matter where I go I love to see other people’s renderings or interpretation of these events. I love to see which parts of the stories the artist chooses to add to the artwork. Art is everywhere no matter where you look.